RHA MA390 Wireless review | What Hi-Fi? If you're on the hunt for a pair of budget wireless earphones, maybe after discovering that your new phone doesn’t have a traditional 3.5mm headphone jack, you could be tempted by these RHA MA390 Wirelesses. 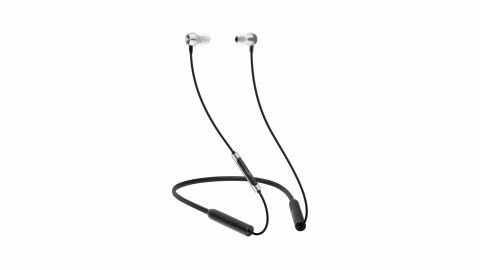 They have a handful of neat features you might not expect at this price, but while the MA390s sound fine, they are based on a wired earphone that costs just £20 – and it shows. RHA settled on a design style for its entry-level earphones years ago, and has mostly stuck with it. The RHA MA390 Wireless earpieces are little aluminium bells that are tough and satin-finished. This touch of class at a budget price has won RHA many fans, but the rubbery neckband, which has slightly hollow-feeling plastic cylinders at each end, seems entirely suited to a budget pair. It’s unlikely anyone will mistake the RHA MA390 Wirelesses for £150 earphones, but they are light and comfortable. Three extras also set the MA390s apart. First, they use USB-C charging. If your phone is a higher-end handset from the last couple of years, it probably uses this socket too. Being able to use the same cable for both is a plus. The MA390s’ earpieces are also magnetic, so they stick together when sitting idle around your neck. It’s a pretty common feature, but one that makes it far less likely you’ll lose the headphones. The battery voice prompt is one of our favourite extras. Turn the MA390s on, and a woman with the smooth accent of a BBC radio presenter, tells you the battery level to the nearest 20 per cent. In an instant, you know whether they’ll last through your run, or if you need to charge them for the evening commute. The RHAs’ battery life isn’t amazing, though, lasting around seven or eight hours from a full charge. That is fine by traditional standards, but in a different world to the SoundMagic E11BTs, which have a battery life of over 30 hours. Otherwise, there are no major complaints about the tech inside the RHA MA390 Wirelesses. The Bluetooth connection is stable, they support the aptX codec and IPX4 water resistance makes them gym and run ready. That means they can withstand ‘water jets’ from any direction, so a little sweat should be no problem. You can get an idea of the sound quality to expect by looking at the pair on which the MA390 Wirelesses are based. RHA’s wired MA390s cost just £20, and while they aren’t perfect earphones, they are decent for the price. However, the SoundMagic E11BTs cost just £10 more, and are based on £40 wired earphones. That makes getting similar sound for £60 a little trickier to stomach. The MA390s sound fine – they aren’t bloated or veiled, nor are they ultra-narrow or thin-sounding, but they certainly aren’t smooth either. Typical of RHA’s entry-level earphones, high mids and treble are a little rough and unrefined, with cymbals sounding slightly harsh. Vocals and guitar lines can seem raw and ragged, without the soft touch needed to reveal detail without testing your ears’ patience at higher volumes. Lower-mid texture is soft, amorphous, offloading more of the responsibility for the music’s information to those slightly problematic higher frequencies. This is the crux of the problem with the MA390s. The information and texture hole in the lower half of the mids urges you to turn up the volume for a more satisfying sound. And this makes the issues in the upper-midrange even more glaringly obvious. Their bass is enjoyable, rich and smoother than the rest of the sound. There’s a good amount of bass detail for this class too, and while bass control isn’t perfect, it is better than average. When you listen to these earphones out and about, the higher frequencies characterise the sound. This is particularly true if you like your music delivered with power, which demands extra volume thanks to the MA390s’ tonal make-up. The RHA MA390 Wirelesses are decent wireless earphones from one of the few British headphone brands making accessible pairs. And there are plenty of nice touches in the tech and design. However, you can get much smoother sound elsewhere in this category. If you like listening at higher volumes, or for long periods, that becomes even more noticeable.